The Dunlin is a two-story Coastal Carolina Island Home. A lovely inverted plan with the primary living areas on the upper floor, it’s designed to provide exquisite views of the Atlantic Ocean and the marsh or Intracoastal Waterway. 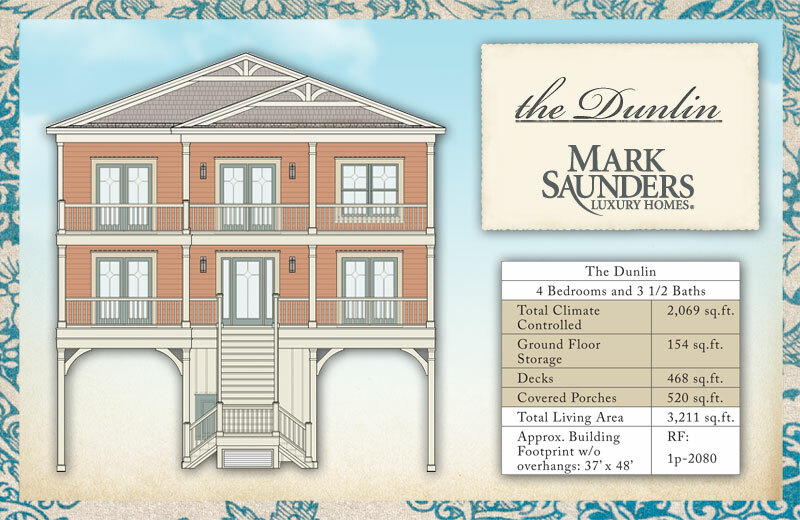 The Dunlin design is ideal for a marsh, waterway or canal homesite. The Island Series starts with our plan, but becomes your design for homes offering extraordinary value, quality construction and the detail for which all Mark Saunders Luxury Homes are known. 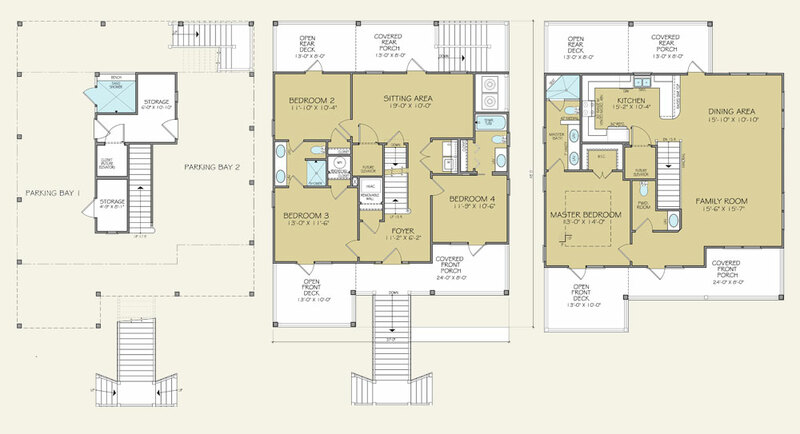 All designs and floor plans offer a substantial list of customization options to assist you in creating your dream home. The Island Series exemplifies superior craftsmanship, structural integrity, architectural innovation, beautiful designs and attention to detail, resulting in lasting value at an affordable price. Contact us today to learn more! This plan is designed, drawn, produced, and owned by Mark Saunders Luxury Homes and any unauthorized use, duplication, reproduction, redistribution, or use of this plan or document without express written permission of the copyright owner is a Copyright Law violation and strictly prohibited by law. Artistic illustrations of the exterior elevations and floor plans are for conceptual purposes only. Dimensions and square footages are approximate, and some illustrated items are optional and at an additional cost. Artistic renderings and other images are for illustration purposes only and do not represent a specific home and site plan as defined in the Master Declaration of Covenants and Easements and Architectural Design Guidelines. Home and customer-specific detailed drawings and specifications will be furnished as part of the Construction Agreement. This drawing represents an instrument of service for the exclusive use of Mark Saunders Luxury Homes and affiliated agents and third-party trademarks are used with implied permission and remain the property of their owner. 8"x8" Pressure–treated pilings embedded a minimum of 11 feet, reinforced with X-bracing as determined by structural engineer. Structural beams (girders) are attached to the home with 5/8” galvanized through-bolts utilizing Simpson Strong Ties HL-35 or HL-55, as specified by the structural engineer. All decks and porches are connected to the structural beams (girders) of the home with galvanized 16d nails and 5/8" through-bolts, using vinyl fabricated flashing. Patio doors on the oceanfront or waterway are Plastpro Fiberglass with 3-Point Lock system. All exterior doors are DP50 rated.